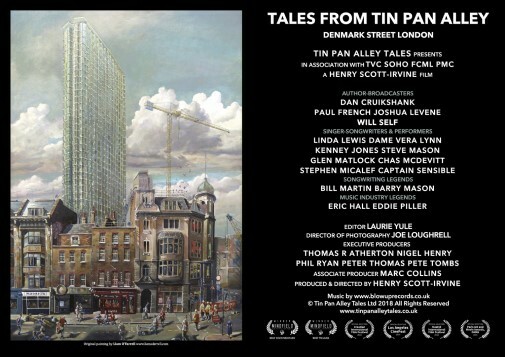 Tales From Tin Pan Alley is a documentary feature about London’s legendary music street Denmark Street. The UK Premiere was held at the Gala of The Portobello Film Festival on August 30th 2018. We have them here now. This is their story – a contemporary urban Canterbury Tale – a vital testament from over 30 musicians, broadcasters and historians. In 2018 Tin Pan Alley’s 110 year old music legacy is currently in peril due to ensuing gentrification, leading to upcoming penthouse flats, hotels, restaurants and a shopping mall. The legacy of those who worked in the street is our testament to Denmark Street’s unique place in international cultural history.